Posted on September 17, 2013 by Warin	in 1993, College, College Football, Halle Berry, James Caan, Omar Epps, Sports, The Program. This is probably one of the most underrated sports films of the last 20-25 years. I loved it when I first saw it 10 years ago and it continues to be one of my favorites. 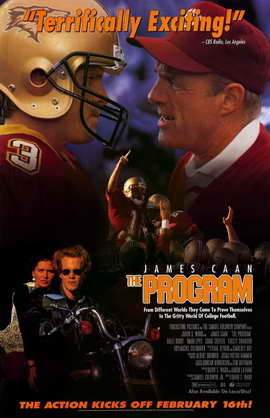 “The Program” is a film about a fictional college football team and the challenges and obstacles they must overcome during the course of a season. That’s really just the icing on the cake however. Over the course of the film we get a view to varying degrees of the men who makeup the squad. There’s the alcoholic quarterback. The freshman running-back trying to supplant the senior in the starting lineup. The fierce linebacker who trash talks the opponent to psych himself up during the game before it eventually costs him. And finally, there’s the coach played by James Caan who is fighting to keep it all together. The film does a good job delving into issues that affect not just college football programs, but college sports in general. Whether it’s boosters putting pressure on an administration, who in turn shifts that pressure towards the head coach, or players going through personal problems that they rather not have highlighted by the media, “The Program” touches on many of these things. It features a young Omar Epps who plays freshman running-back Darnell Jefferson and Halle Berry who plays Autumn Haley, who is Jefferson’s academic tutor.